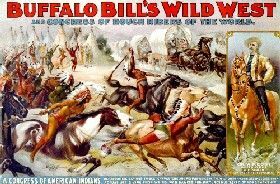 One morning in the spring of 1877, when she was riding towards Crook city, she met a stagecoach running from Cheyenne to Deadwood with Indians in hot pursuit. Pulling alongside, she found the driver lying face downwards in the boot of the stage, having been shot with an arrow. Taking the driver’s seat, she drove the coach to Deadwood, carrying its six passengers and the wounded driver. 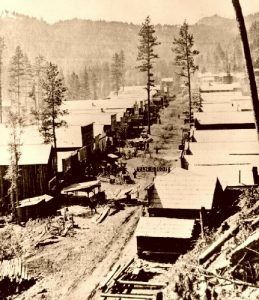 Calamity left Deadwood in the fall of 1877, and traveling to Bear Butte Creek with the 7th Cavalry, where they built Fort Meade near the town of Sturgis. In 1878 she left the command and went to Rapid City where she spent the year prospecting, with little success. By early 1879 she was in Fort Pierre driving mule trains to Fort Pierre and Sturgis. By 1882 she was in Miles City, where she bought a ranch on the Yellowstone raising stock and cattle and kept a way side inn. Ever restless, Calamity went to California in 1883, but left for Texas in 1884. While in El Paso, she met Clinton Burk, a native Texan, whom she married in August 1885. On October 28, 1887, she gave birth to a baby girl. They left Texas in 1889 and went to Boulder, Colorado, where they ran a hotel until 1893. During the next three years, the Burk family traveled through Wyoming, Montana, Idaho, Washington, Oregon and South Dakota. For the next few years, Calamity tried to sell her life story to anyone who would listen. Having the reputation for being able to handle a horse better than most men and shoot like a cowboy, her skills took her into Buffalo Bill’s Wild West Show in 1895 where she performed sharp shooting astride her horse. She toured Minneapolis, then Chicago, St. Louis and Kansas City, bringing to the stage the rip-roarin’ west as she had lived it. She always managed to get drunk and get fired without ceremony. In 1900 Calamity Jane was found by a newspaper editor in a bawdy house and was nursed back to health. In 1901 she was hired by the Pan American Exposition for a good job with fine pay in Buffalo, New York. But again she got liquored up, shot out the bar glass, made Irish policemen dance the jig to her roaring guns, and then stumbled down the street cursing the whole town. She was run out. In the summer of 1903, Calamity Jane returned to the Black Hills for the last time. In the final stages of raging alcoholism and carrying her pathetically few belongings in a dilapidated old suitcase, she found refuge at Madam Dora DuFran’s brothel in Belle Fourche. For the next few months, Jane earned her keep by cooking and doing the laundry for Dora’s brothel girls. However, by August, Calamity Jane was dying in a frowsy little room in the Calloway Hotel in Terry, near Deadwood, South Dakota. Her last request was to give her the date – August 2, 1903 – and then requested that she be buried next to the great American gunfighter, Wild Bill Hickok, on Mt. Moriah overlooking the town of Deadwood. Her wish was granted. The funeral was the largest to be held in Deadwood for a woman, and Calamity’s coffin was closed by a man who, as a boy, she had nursed back to health when the smallpox epidemic took so many lives in Deadwood. Calamity Jane may have been second only to Wild Bill Hickok in exaggerating her early life exploits into something that only a dime store novelist would believe. Many of those exciting adventures came from Jane herself, and most of them could not be corroborated by others. However her legend as a hard drinking woman, wearing men’s clothing, and living a rough and raucous life continues.